An unaltered photocopy of your DD-214, WD AGO, NAVPERS, NG or other military issued document clearly displaying your award of the Coast Guard Commandant Letter of Commendation. Among the oldest of the awards presented to members of the U.S. Coast Guard, the Commandant's Letter of Commendation has always been in the form of a letter or commendation certificate. 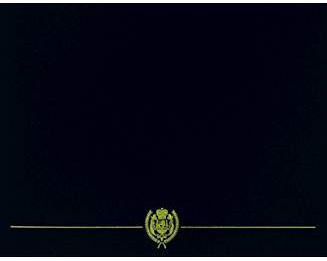 The ribbon bar was established on March 17, 1979, by the Commandant, to accompany the Letter of Commendation. It is awarded to members of the U.S. Armed Forces, serving in any capacity with the U.S. Coast Guard, for an act or service resulting in unusual or outstanding achievement. The Commandant's Letter of Commendation was established on August 12, 1921, by Commandant of the Coast Guard Rear Admiral William F. Reynolds. The Commandant's Letter of Commendation Ribbon was established on March 17, 1979, by Commandant of the Coast Guard Admiral John B. Hayes. The Commandant's Letter of Commendation Ribbon was made retroactive to all recipients of the Commandant's Letter of Commendation; hence, it has effect from August 12, 1921 to the present. 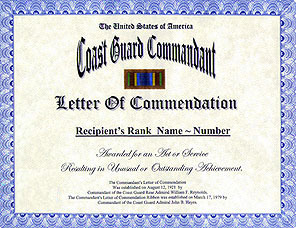 The Commandant's Letter of Commendation was originally created to enable the Secretary of the Treasury or the Commandant to address a Letter of Commendation to any individual in the Coast Guard for "meritorious service resulting in unusual and outstanding achieve-ment rendered while the Coast Guard is serving under Treasury Department jurisdiction." The current ribbon is awarded to any member of the Armed Forces of the United States, serving in any capacity with the Coast Guard, for an act or service resulting in unusual or outstanding achievement, whose performance is less than that required for the Coast Guard Achievement Medal. NOTE: This ribbon is considered a personal decoration. The Commandant's Letter of Commendation Ribbon is worn after the Achievement Medal and before the Navy Combat Action Ribbon. The Coast Guard Commandant's Letter of Commendation Ribbon may not be worn on the Navy or Marine Corps uniform. Since this ribbon is considered a personal decoration, additional awards are denoted by gold stars five-sixteenths of an inch in diameter (a silver star of the same size denotes a sixth award). The Operational Distinguishing Device, a silver O, may be authorized for wear on this ribbon.